What Makes Vermont Special, by Greg Carpenter. Published by Shires Press. 134 pages. Paperback. $24.99. Greg Carpenter, a teacher in Swanton who summers on Echo Lake in Charleston, says the idea for his recent book, What Makes Vermont Special, came from a student. He worked on it for three years, traveling around Vermont taking the photographs himself, and doing the research. The book’s subtitle is An In-depth Look at Vermont State Symbols. But it’s more than that. For instance, the first photograph in the book is a stunning view of Vermont’s biggest granite quarry, located in Graniteville (of course) and owned by Rock of Ages. It’s nearly 600 feet deep. And the oldest commercial maple orchard in the country is at Sugar Tree Farm in Dummerston. It’s been in operation since 1764. 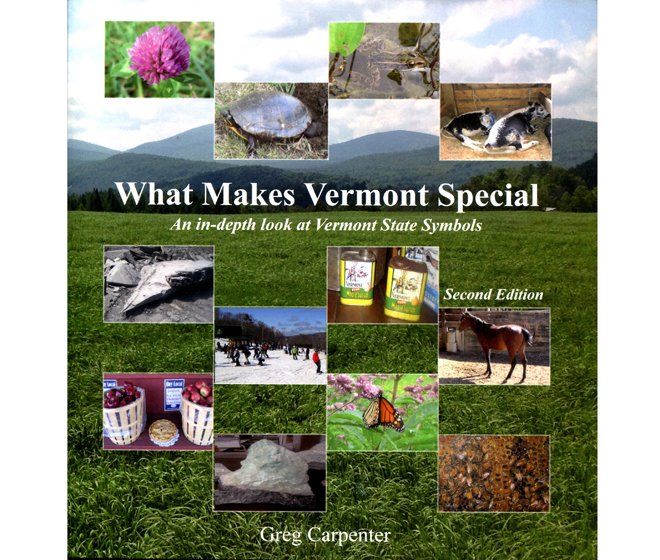 The book primarily offers information about Vermont symbols. Personally, I did not know that Vermont had a state amphibian. It’s the northern leopard frog, which can be found at the Missisquoi National Refuge in Swanton. And there’s a convoluted story behind it. Students at the Cornwall Elementary School set out to propose a ban on six-pack plastic rings. Amphibians were the last thing on their minds. But their initial goal was thwarted. The Cornwall students moved on to a less daunting initiative: recommending a state amphibian. They settled on the northern leopard frog after studying Vermont ecosystems and learning that scientists were finding many frogs with missing limbs and other deformities. There are more than 75 color photos of state symbols, landmarks, or milestones, and each is accompanied by a brief history. The state horse is the Morgan, of course, the drink is milk, and the bird is the hermit thrush. It turns out that the process of choosing a state bird was one of the most contentious of any for official state symbols, Mr. Carpenter writes. “Over 70 years ago, according to the Montpelier Evening Argus, Senator Howard Rice was complaining about the cost of picking the state bird, which he estimated to be $300 in what he called a ‘merry little exchange of nonsense,’” Mr. Carpenter writes. The birds up for consideration included the robin, crow, blue jay, stork, screech owl, and mud hen. The hermit thrush was chosen because of its sweet call, the fact that it’s native to Vermont, and that it can be found in all 14 counties. The vote on making it the state bird, a move endorsed by the General Federation of Women’s Clubs of Vermont, was 13 yes, 13 no, and four not voting. Lieutenant Governor Mortimer Proctor was called in to break the tie. Who knew that picking a state bird could be such a troublesome legislative issue? And who knew Vermont had a state fossil? The state fossil, it turns out, is that of a white whale, and it’s at the Perkins Geology Museum in Burlington. In 1849, a Beluga whale skeleton was found in a farmer’s field in the western Vermont town of Charlotte, in an area that had once been the Champlain Sea. Students from BFA-Fairfax Elementary School are responsible for the fact that Vermont’s state fruit is the apple, and its state pie is apple pie. And third- and fourth-graders at the Barnard Central School came up with the idea of having a state insect — the honeybee, although it’s not native to Vermont. This state seems downright obsessed with state symbols. We even have a state soil: Tunbridge soil. Vermont’s state soil, tree, and flavor (maple) are tied together, since Tunbridge soil is ideal for growing maples, and the mineral content absorbed by the trees contributes to the flavor of Vermont maple sap. Corn almost became Vermont’s state vegetable. A bill to that effect was to be introduced in 1985 but didn’t quite make it. Cows never made it as Vermont’s state animal, and snowmobiling didn’t replace skiing and snowboarding as the official Vermont sports. Barton’s own state Representative Jonathan Fuller was the lead sponsor of the bill naming a state flower in 1894. That would be the red clover. Mr. Carpenter has dug up an interesting story behind state flowers. “In 1893, an effort was made to name a national flower at the Chicago World’s Fair,” he writes. “The effort failed, as no one could agree on which flower would best symbolize our country. The society determined that each state would choose a flower that would be approved by each individual state’s Legislature. I certainly wasn’t aware that the humble red clover was an integral part of so lofty a goal. The book is available through the Northshire Bookstore, 4869 Main Street, P.O. Box 2200, Manchester Center, Vermont 05255, or call (802) 362-3565, extension 117.